While some of us are blessed with good skin, some others are prone to problems like acne, loose skin, stretch marks etc. I find a lot of people complaining about loose and sagging skin. What is the reason for this? Is there a way to avoid or reduce it? While loose or sagging skin is a classic sign of aging, there are several other reasons for them - Excessive skin exposure, a lack of skin elasticity, hereditary, rapid weight loss etc. A lack of skin elasticity is one of the most important causes of loose skin. Skin elasticity is contributed by two proteins - elastin and collagen that keep the skin firm and supple. The content of these proteins reduce with age, unhealthy lifestyle habits and excessive sun exposure. Vitamin C is an important contributor to collagen production. Hence, if you do have sagging skin, incorporate vitamin C rich foods like Amla, guavas, tomatoes and oranges in your daily diet. Sun exposure is another reason for sagging skin. Excessive UV absorption by the skin can break down it's elasticity. Use the right type of sun screen lotion and try staying away from unnecessary exposure. Rapid weight loss can lead to loss of fat under the skin, especially in areas like the arms, buttocks, cheeks, thighs, stomach etc. which can lead to sagging skin. This is commonly seen in individuals trying crash diets, fasting to lose weight and people who opt for liposuction and other types of surgeries. This factor is completely under your control and needs you to follow the right kind of fitness rituals. Muscle building and toning is the best remedy to get rid of sagging skin in this case. Make sure your fitness instructor doesn't focus on only cardio training to lose weight. Insist on moderate weight training at least 2-3 times a week, so you build your muscles. This will help filling up your loose skin with muscles and making it look firmer and healthier. - Keep your skin hydrated by drinking enough water through the day. - Keep your facial muscles moving. Chew gum or even practice simple facial exercises daily. - Exfoliating your skin with a gentle scrub, preferably home-made, will make a difference to your skin. - Keep your skin moisturized. - Limit smoking and alcohol to a bare minimum. 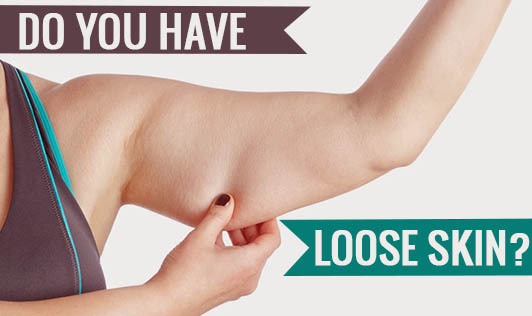 These factors can speed up the formation of loose skin. - Essential fatty acids like Omega 3 rich foods have a positive effect on the appearance of your skin. - Antioxidants help in reducing skin damage by sun exposure. Incorporate lots of vegetables and fruits in your diet daily. Although loose skin is not completely avoidable, a small amount of care from your end can delay the process and make a difference.